"Stacking two cookie doughs makes for an impressive-looking cookie. It also means you don't have to pick between your two faves! You just need two cookies that bake in about the same time. I used a half batch of two Allrecipes recipes-Big Soft Ginger Cookies and Chef John's Peanut Butter Cookies--with minor changes (less water and more flour to bulk up the base recipe, for example) and a little water to adhere them." Cookies keep up to 3 days in an airtight container at room temperature, or up to 3 months frozen. This recipe is amazing, my whole family loves it! 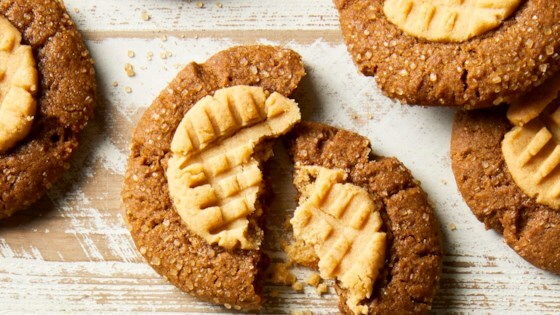 These cookies were delicious, chewy and subtle peanut butter. A holiday hit! Even my curmudgeon Scrooge friend who growls at desserts loved the ginger molasses/peanut butter combo. Have also made both recipes as stand-alone cookies. Yum.